Today was an historic day for local democracy as Portlaoise Town Council elected the first black mayor in the history of Ireland. Cllr. Rotimi Adebari was elected by a vote of 6 to 3 in a crowded Council Chamber. Cllr. Adebari, a Nigerian national, arrived in Ireland in 2000 and settled in Portlaoise Town. In 2004 he ran for the local Portlaoise Town Council Elections and became the first non-national to take up a position as a public representative in Laois. He then took up the Chair for the election of vice-cathaoirleach, Ms Mary Sweeeny. Both were warmly congratulated by their fellow councillors. A new book is set to hit the market from the pen of Award winning blogger and author of romantic fiction, Myne Whitman. The novel, titled A LOVE REKINDLED is set in the United States and Nigeria, and is a story that entertains, is emotionally engaging, and provides a window into Nigerian culture, places and people. This book was written to showcase local characters in a loving relationship, something that is almost never seen in books. The author also witnessed ethnic violence in Warri and decided to explore this topical issue through fiction. Universities are called the ivory tower. This is where intellect is sharpened and minds are developed. However, the country’s universities appear to have figuratively added a new course: “Sexology.” Although this infamous course does not earn anybody a degree, it’s so popular that many female undergraduates go for it. And they are making fortunes. Dire circumstances drive a brilliant school girl into the seedy world of prostitution. "Working Girl" explores the social issues of poverty, prostitution, maternal sacrifice and the duplicity of people at higher levels of society. It's a riveting, emotional drama, interspersed with moments of comic relief. WARRI, 17 December 2010 (IRIN) - As families count the cost of another military operation against militants in the Niger Delta, analysts say up to now government efforts to quell violence are hampered by corruption and fail to get at the deep-seated causes of unrest in the region. Residents told IRIN hundreds of families are still displaced more than two weeks after the crackdown. It should be clear by now that we are at the cusp of a new era of classic, no-holds-barred, in-your-face minstrelsy. Just this year alone blackface "incidents" have flared up in cultural zones ranging from America's Next Top Model to critics’ darling Mad Men, from YouTube and Facebook to this years' edgiest of Halloween costumes. French Vogue's recent photo-spread of a model in blackface was therefore less an act of racism than a calculated statement of the zeitgeist. 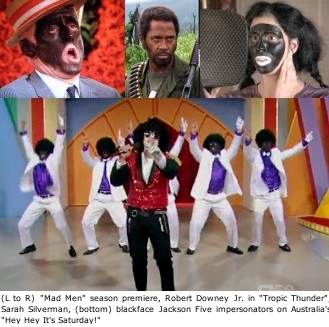 That it so quickly followed on the heels of a now notorious blackface Jackson Five impersonation broadcast on Australian television was telling: the skit immediately went viral just as blackface did the moment it appeared in nineteenth century America.